The Glaucoma services of Sadguru Netra Chikitsalaya has experts who treat patients with conditions that have a poor prognosis, including those who have had unsuccessful glaucoma surgery or have secondary glaucoma, advanced glaucomatous optic atrophy and patients who have vision in only one eye. Congenital and childhood glaucoma are also part of the special expertise. Our ophthalmologists specialize in all types of glaucoma — congenital, combined mechanism, narrow angle, open angle, and normal tension. 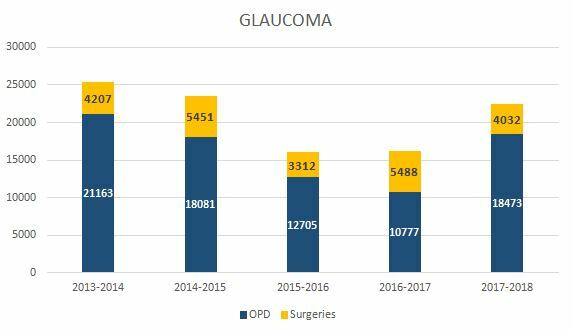 Glaucoma is the most dreaded silent thief of the vision- and management of the disease requires equal rigor and dedication to gain expertise on. Sadguru Netra Chikitsalaya aims to target the Ophthalmologists who have recently completed residency through intensive training to impart skills in the recent advances in the diagnosis and treatment of glaucoma. MS SSMC – APSU, Rewa. Fellowship Sadguru Netra Chikitsalaya, Chitrakoot. 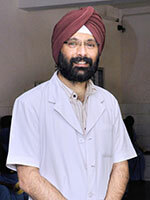 Designation Consultant, Department of Glaucoma Services, Head PG Academics. Fellowship - Comprehensive Sadguru Netra Chikitsalaya, Chitrakoot. His area of interest is research. Association of raised intraocular pressure and its correlation to the energy used with raised versus normal, IOP following Nd YAG Laser Posterior Capsulotomy. 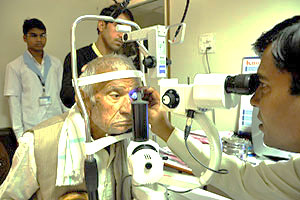 Role of USG –B Scan in eye with mature cataract. Effect of refractive status on peripapillary nerve fiber layer. Short term changes in Intraocular pressure after phacoemulsification. Have poor vision, especially field of vision. Take certain steroid medications, such as prednisolone, for a long time. Open-angle glaucoma is most commonly treated with various combinations of eye drops, laser trabeculoplasty, and microsurgery. Traditionally, medications are used first, but there is increasing evidence that some people with glaucoma may respond better with early laser surgery or microsurgery. Infant or congenital glaucoma -- meaning a child is born with it -- is primarily treated with surgery since the cause of the problem is a much distorted drainage system. Glaucoma cannot be prevented, but if it is diagnosed and treated early, the disease can be controlled. Adopting an active lifestyle (as opposed to a sedentary one) is supposed to reduce the risk of glaucoma to some extent, but no definite data is available on the extent of risk reduction. 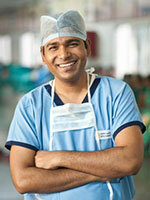 At this time, loss of vision caused by glaucoma is irreversible and cannot be restored. However, successfully lowering eye pressure can help prevent further visual loss from glaucoma. Most people with glaucoma do not go blind as long as they follow their treatment plan and have regular eye check-ups. Glaucoma is a group of diseases that can damage your eye's optic nerve and result in vision loss and blindness. It is one of the leading causes of blindness in Australia, affecting approximately 3% of the population. It is more common with advancing age, and in women. Nearly half of people with glaucoma do not even know they have the disease. While there is no cure for glaucoma, the good news is that if diagnosed early, the disease can usually be controlled with ongoing treatment (eye drops, laser and surgery) and blindness can be prevented. What are the symptons of Glaucoma? For most people, there are usually few or no symptoms of glaucoma. The first sign of glaucoma is often the loss of peripheral or side vision, which can go unnoticed until late in the disease. Detecting glaucoma early is one reason you should have a complete check-up with an eye specialist every one to two years. Occasionally, intraocular pressure can rise to severe levels. In these cases, sudden eye pain, headache, blurred vision, or the appearance of halos around lights may occur.